Bassekou Kouyate is sometimes called the Jimi Hendrix of the ngoni, but I think he’s really the Earl Scruggs -- like Scruggs, he’s revolutionized the technique for playing his instrument, turning it into a vehicle for soloing where it had previously served a rhythm function. Bassekou has a new band featuring two of his sons, and a new sound that’s even more aggressive and electric than ever. 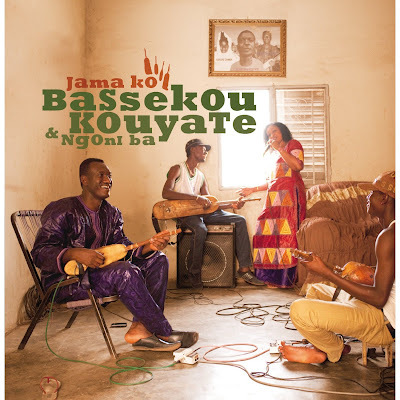 Much of the material here comes from the bottomless well that is the Mande musical tradition, but this band plays that tradition differently from any other – the tempos are fast, there’s a twitchy energy to everything they do, they even turn the second half of track 11 into a Congolese-style sebene. And then there are Bassekou’s solos, many now using wah wah pedal and other guitar-adapted effects (1 is a perfect example) – you’ve never heard anything like this guy’s playing. There are some virtuoso star turns here as well: singer Kasse Mady on track 2 and kamale ngoni player Harouna Samake on 3 and 6. And Bassekou’s wife Amy Sacko, who takes most of the lead vocals, is now a first-tier Malian diva in her own right. A big wow, and an early contender for 2013’s album of the year.